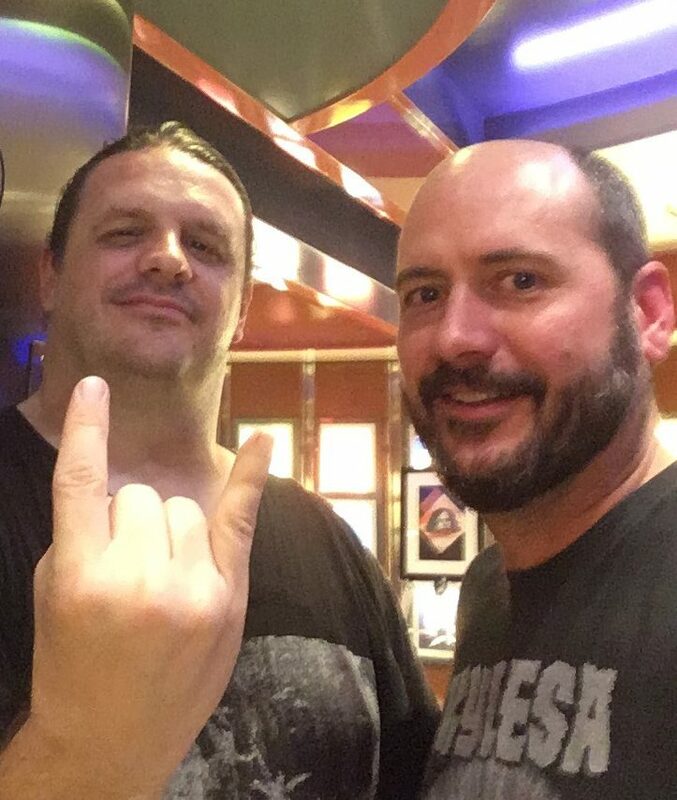 So you are on a boat, in the middle of the Atlantic ocean, with 2,999 of your new friends and 60 metal bands who are each going to play two shows over four days. While the benefits of being on 70,000 Tons of Metal are clear for many, perhaps not everyone sees the magic that can happen in this environment. Our answer? When they started to pack the punch that this cruise delivers year after year. But there is more to it for those “Survivors” who have made the trek. They will recognize that this isn’t just one venue, it’s four. We thought we would rank the venues on the Independence of the Seas and explain why we won’t miss a 70,000 Tons of Metal cruise. Nestled on deck five of the ship is Star Lounge, an intimate, club-like space that may be small, but it captures a lot of energy. While sight-lines can be challenging given its size and set-up, no one cared last year when Exhumed started their set – the first of the cruise – as soon as the ship pulled away from the dock. While everyone was trying to get their sea-legs, it was a sure sign of “game on.” A bit later, we stopped in for a few minutes of Psychostick, and the place was going absolutely nuts. Yes, you read that right. When we arrived on the boat and I saw this, I was ready to lace up my ice skates, but alas, it wasn’t’ meant to be. I would have to settle for an ice-skating-ring-turned-music-hall. Standing tall on the second and third decks, this venue resembles a small arena located in the bowels of the ship. There is plenty of room for sitting or moshing, and the seats here have been known to serve up some intensely lounge napping spots. Our recommendation for those looking for the best sound quality at Studio B is to stand back in the rear of the floor where the music can hit you head-on. You won’t be sorry. 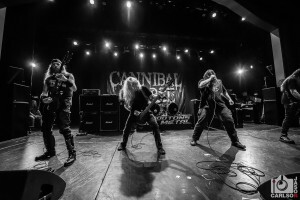 Cannibal Corpse in the Royal Hall on 70,000 Tons of Metal 2018 By Jason Carlson! The theater environment provided by the Royal Hall is awesome. Plush seats, plenty of room (it is five stories tall), and great acoustics make this the place to witness your favorite acts. Watching the pit churn to Cannibal Corpse was one of the highlights last year (not to mention a surprise stage-bomb from Sammy of Goatwhore). Given the previous note about napping, there is true comfort in these seats for those who need a little shut-eye to keep the party going. In contrast, the floor space is conducive to massive pits that swirl with the intensity of hurricanes. 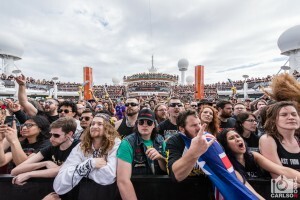 Fans line up on the rail for Alestorm on the Pool Deck Stage during 70,000 Tons of Metal 2018. Photo by Jason Carlson. It truly doesn’t get any better than the pavilion style environment of the pool deck and its massive stage. Consider this locale the centerpiece for performances at 70,000 Tons of Metal, and it is complete with a couple of hot tubs to the side, one looking straight at the stage, and bars surrounding the pit area. The multiple levels of the deck provide numerous perspectives from which to watch the show, and you can’t beat the fresh salt air, cool breezes, and clear skies. Oh, and during the day, make sure to wear your sunblock, courtesy of the Pool Girls. The ninth annual 70,000 Tons of Metal cruise will depart from Ft. Lauderdale, Florida, on January 31 on its way to Labadee, Haiti and back. The four day cruise is limited to 3,000 tickets, and it will boast 60 bands each playing twice. For more information and to purchase a cabin (public onsales start October 3 at noon EST), visit the 70,000 Tons of Metal site here! 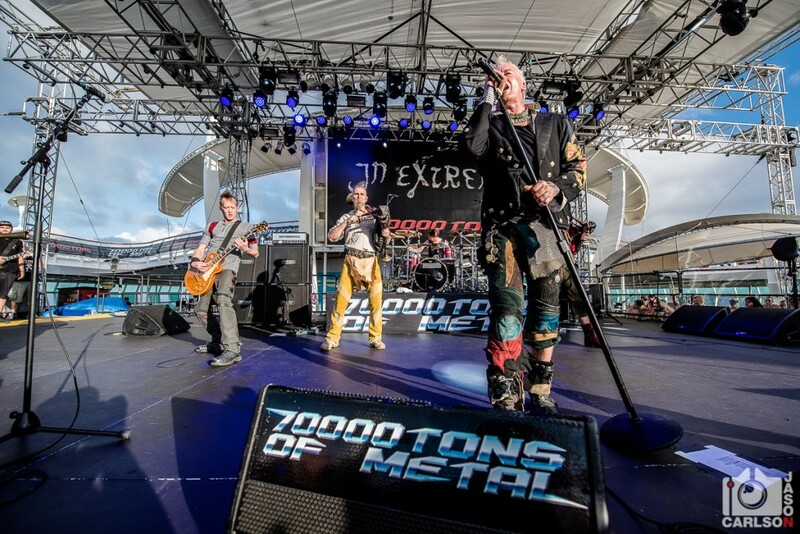 In Extremo on the Pool Deck Stage from 70,000 Tons of Metal 2018 By Jason Carlson!